The Toronto Fringe Festival has offered up a real gem with Restless Spirit, produced by Lago di Lupi Productions, playing at Theatre Passe Muraille – Mainspace. Restless Spirit explores the question of whether or not ghosts exist, and if those who claim to communicate with them are all frauds, bent on exploiting the bereaved. When I entered the theater, Nicole Marie McCafferty was already playing Nell, listening to spirits , in a trance, with great focus. There were no sound effects or music in Restless Spirit. There were no sounds besides the actors, and the knocking of those spirits. The lighting was very simple, yet the effect seemed to make the dark even darker. The set was basic as well, with just a table and chairs. This simplicity allowed the dialogue and acting to stand out. The calibre of acting here is exceptional. The innocence and intensity of Nell is compelling. You want to believe her. Surely, she wouldn’t lie! Clara Boyden (Catherine Meyer) can’t believe when Nell recites facts about her dead daughter that no one would know. Imagine being able to hear from a loved one who was gone. I was really touched by Clara’s reaction. Lillian Dawes (Elaine O’Neal) is Nell’s sister and accepts that Nell speaks to ghosts and does her best to protect Nell, which she does by hiding her from the town. Lillian’s husband Charlie Dawes (Damien Gulde) conspires with Amos “Red” Hollowell, the town newspaper reporter (Dylan Maloney) to use Nell. Both actors were adept at portraying the requisite amount of sleaze. They took advantage of the Spiritualism craze, where mediums who could communicate with the dead stood to cash in. 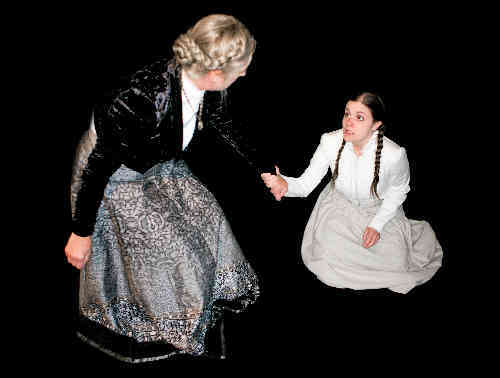 The costumes are well done and reflected the Spiritualism period of the late 19th Century. I am part of an historical reenactment group, so believe me, I notice details. I’m not an expert on that particular period, but the impression seemed authentic. I was looking forward to the seance, and audience participation made it even more exciting. The visual representation of the spirits was really fun. I loved Restless Spirit. I left the theatre with questions. I wanted to know more about Nell, but I appreciate that sometimes you just have to live with mystery. Content Warnings: Fog or haze effects; Audience participation. This venue is wheelchair-accessible. Accessible seating is in the very front row. Who wrote it? Who directed it? Hello, Paul. It was both written and directed by Alison Minors. I caught this one last night, and my whole take-away is “Nicole Marie McCafferty is SO, so good”. The eyes, the body language, the voice, it’s all just perfect.